Public Education: Is It Broken? Depends on your perspective. If you are a parent or concerned citizen finding your efforts to improve your schools blocked, it is a broken system that allows that to happen. It’s a case of no one being responsible for inaction where and when action is needed. When “the system” becomes a barrier to improvement—through unacceptable policies and practices — the system is broken. The result is unacceptable policies leading to unethical testing, scoring, and reporting practices furthering the already existing inequality of opportunity, segregation, and privatization. I hope people everywhere can agree on this; this is a cycle that is dismantling the system, piece-by-piece, policy-by-policy. Those openly aiming to privatize the public education system are boasting over the strides they have made in transforming the system. This is the data they track! Comparing to overall funding!!!! Success is when the public system is fully privatized? Is that what the public has agreed to? My theory, speaking as a parent with children in the system during the first big take-down (the No Child Left Behind policy), is that privatization never would have gotten this far if policymakers AND the public had been listening to the multitude of people trying to stop the political machine driving the movement and driving our children over the cliff in the process. But we can’t go back and change what happened; we can, however, change policies. What we can do is move forward determined not to repeat the mistake of ignoring the crucial voices of people wanting to do the right thing for the right reason. We have to sort out those who are offering real, good, practical solutions to existing significant problems—true reformers —and those wishing to transform the system to fit their ideology or to profit the education-industrial complex. 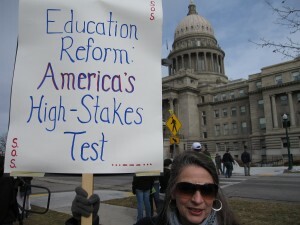 To understand real education reform, we have to understand the real problem. Those that think education reform will come about through standards, testing, labeling, and degrading schools obviously don’t understand what “reform” is and is not. Reform requires a problem be identified and the faulty practice creating the problem be replaced with a better one. When we tack on “education” in front of the word reform, it implies we are talking about a reform of the education system. Systemically, did every school set low standards and miserably under-educate children? No, we have some very highly performing public schools; they are in the majority. Does any school under-test their students? Not that I’m aware of. Is the whole system to the point where there is no hope for it and it should be dismantled and privatized? Absolutely not! That is what reform is not. That is a simple transfer of control from public to private hands. It’s a costly shell game. Real education reform requires that the public come to an understanding of what proven effective education reform really is and develop the drive and unyielding determination to establish all the elements of success in every school. Edmonds (1935-1983) was the lead researcher for what became known as Effective Schools Research.